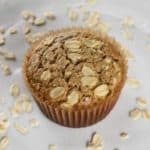 Made with coconut sugar and honey, these gluten-free Oat Flour Muffins are perfect for breakfast on-the-go or an afternoon snack. Line a muffin tin with 12 baking cups. Whisk together eggs, ½ cup melted butter, milk, coconut sugar, applesauce, honey and vanilla in a large bowl. In a separate bowl, mix gluten-free oat flour, cinnamon, salt and baking soda. Fill baking cups with batter until used up. Top each muffin with gluten-free oats. Using a pastry brush, coat the top of each muffin with the remaining melted butter. Bake for 22-24 minutes until toothpick comes out clean.